Noah Harman as Roderigo and Quintin Gigax as Iago sqaure off at a recently “Othello” rehearsal. 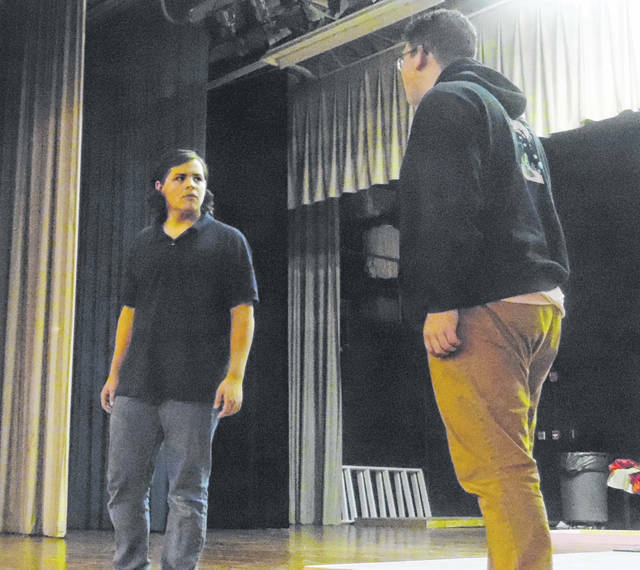 This year the Wauseon High School theatre will be putting on the Shakespearean play “Othello.” It is a powerful story of betrayal, jealousy, and dishonest intentions. The main characters are Othello, Iago, Michael Cassio, Desdemona, and Roderigo. These of course are not the only characters. Other important roles are Iago’s wife Emilia and Bianca. Each actor and actress brings something special to their respective character and each of them have some words about the show. Everyone spoke about their favorite lines and scenes they take part in; every character has something special to show and here is a taste of what these characters get into. Othello is described in the play as “constantly loving, noble, and trustworthy.” In act 3 scene 3 he says, “I’ll see before I doubt, when I doubt prove, and on that proof, there shall be no more but this.” Uzziah DeLaCruz, who plays Othello said that this line sticks out to him in particular because, “so often people want to live in a life of jumping to conclusions.” This line specifically outlines the trusting nature of Othello which for some is seen as a sign of virtue, but to men like Iago it is a weakness to be exploited. Next is Iago, played by Quintin Gigax. He is describe as honest by many characters, but in reality that is not the total truth. Gigax said his favorite line would be a cut line from act 1 scene 3, “virtue, a fig. It is in ourselves that we are thus, or thus. Our bodies are gardens and our wills are gardeners.” This line alone outlines Iago’s entire philosophy. He believes that destiny is in the hands of man and virtue is merely a social tool to keep ambitious men like him from power. This line is actually spoken in conjunction with my favorite scene in the entire show between my character Iago, and Noah Harmen’s character Roderigo. In this scene Roderigo is confessing something major to Iago, who he believes is his loyal friend. Throughout this interaction however, you see how heartless and cold Iago is. He is a character so charismatic yet ruthless he can literally talk a man down from the edge of death only to use him later. The character Michael Cassio, played by Christian Cantu, can best be summed up as young, handsome, charismatic, and as Iago would call him “a pestilent complete knave.” Cassio is a man of many great words, but to Cantu there is one line that sticks out to him most, “God’s above all, there be souls that need saving, and there be souls that not need saving.” This stuck with him because as a very religious man he believes he must “go after those who need saved” which is the whole impetus of the line; some people need to be saved and some need to save others. Desdemona, played by Monica Betz, is supposed to be the most beautiful lady of Venice, and while she is married to Othello she is much more than just a pretty face. She is a strong willed woman who speaks her mind, and once again as Iago would say, “she holds it in a vice to do no more than what she is requested” meaning she hates to do only what she is told. This line sticks out to Betz because in the scene Othello has reason to believe she has committed a sin against him, but this line suggests that the only sin she has committed is loving him. Lastly is Roderigo, played by Noah Harman, He is a wealthy businessman of Venice who is a long time suitor of Desdemona and “friend” of Iago. He plays an integral part in Iago’s plan for revenge. He has many interactions with Iago and in one of which he utters the line, “I have no great devotion to the deed and yet he hath given me reason.” Harman said this line speaks to him because it just shows at what lengths Roderigo will go to win the Love of Desdemona. Director Jason Robinson is a major part of the success of this show. “While it’s great that we go out and entertain in theatre… we have to remember the fact that we are a part of the school and part of my job giving these students an education in theatre is to actually educate them and give them diversity and experience,” said Robinson. Coming from one someone taking part in the show it has been quite eye opening just learning to speak this language, which is so foreign to so many people, is so exciting and being able to on a whim start speaking in iambic pentameter is so new and interesting. Robinson’s hope, and by extension the rest of the cast’s hope is that, “people will be able to come and understand it, I think they will like our interpretation of the show, I think people will like the setting and time frame which we have placed it. Othello goes live Thursday, at 7 p.m., as well as Saturday at the same time, and Sunday at 2 p.m.